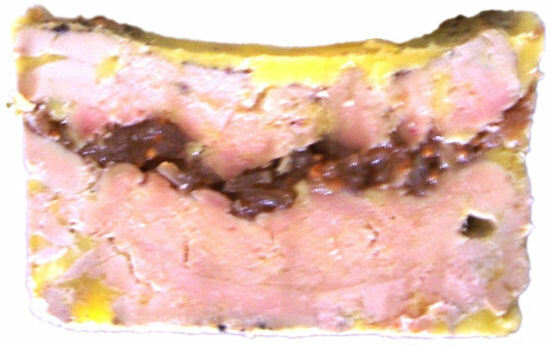 "Terrine" is the name of both the ceramic vessel in which the dish is baked (terrine à foie gras), as well as of the end product (terrine de foie gras). Preparation time - fig compote: 10 minutes. Cook time - fig compote: 45 minutes. Bake time - terrine: 15 minutes. Makes two terrines of about 350 grams (3/4 lbs). Make the compote one or more days ahead of making the terrine. The fresh duck liver must be very cold before deveining it. 4 tablespoons of Armagnac - do not worry, the alcohol will entirely evaporate in the process! actually, I think you should worry! if you live in an uncivilized part of the world and don't have Armagnac in your liquor cabinet, you may commit sacrilege, and use Cognac. There are three steps. First the fig compote is made. This can be done a day ahead. Of course, if you prefer to make the terrine without a layer of fig compote, you may skip this. Next, the fresh foie gras has to be prepared. The biggest job is removing major blood vessels and associated tissue. Finally, the terrine is baked. continue until reduced to a very thick consistency is obtained and the fig skins are soft; then remove from heat, and cool to room temperature. this should take at least 45 minutes; if it becomes very thick before that time, add some water. when cooled off, the compote should be hard to "cut" with a spoon! So, don't even try and use fig jam or store bought fig compote: your terrine will be a disaster, as the foie gras below the layer of compote will not be cooked! The compote can be kept in the refrigerator, but must be at room temperature when used in the terrine! See the photos below. If done well, this is a very time consuming process. But you don't have to remove every little vein or artery. Once you're done, it may look like you have buggered up the entire liver! Don't worry, it will get puttied back together in the terrine. Put the liver in ice cold water (or in a very cold refrigerator) several hours before you prepare it. The liver will warm up when you are handling it by hand. It will become slippery/greasy, as will your hands. Once you split the liver into its two lobes, put the lobe that you are not working on back into the cold water. prepare the liver as shown above. important: with thumbs or fingers, press the liver firmly into the dish, especially the corners. note: as stated before, if the compote is soft or even runny at room temperature, the liver below the compote will not get cooked! I use the same fig compote in my Duck Wellington recipe. Obviously this recipe is made with foie gras of duck, not of goose! I prefer duck, and I live in the southwest of France: duck country. Force-feeding geese is cruel, as they resist. Ducks don't resist like geese, and the feeding only takes 2x 10 seconds a day during the last two weeks of their 3-4 month life. The ducks are typically free-roaming (I cannot judge the practices in China and eastern Europe, but countries where humans have no rights, animals have even less). Compare that to the horrible life of industrial chickens! ©2005-2016 F. Dörenberg, unless stated otherwise. All rights reserved worldwide. No part of this publication may be used without permission from the author.